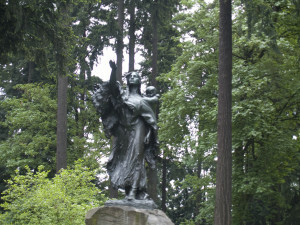 Back in 1905, a mere one hundred years after Lewis and Clark walked, paddled, drifted, ran, hunted and rode their way across the Louisiana Purchase, Portland Oregon celebrated by putting on the Lewis and Clark Exposition. The Exposition did little for Lewis and Clark though, instead it promoted Portland and it’s potential trade links with China and other Asian destinations. By all accounts the Exposition itself was a huge hit and made a 21% profit for it’s backers and was directly responsible for Portland’s economic growth for years later. Little remains other then dim memories, a few various buildings scattered across the city, postcards and this statue of Sacagawea. The site of the Exposition, including the lake, was filled in by one of Portland’s well meaning citizens at the time and created a glut of new real estate just barely outside of the city limits. Several buildings were salvaged and moved to become residences for future citizens. The huge log cabin built for the Exposition was burned down by an arsonist in 1964, and another was totally demolished in 1981. Economically this Northwest area still provides a huge industrial base for Portland, but one can not but wonder how the city would be changed if the site was still around. At least two history books written about the Exposition around the 60’s state that this statue was moved and “lost, never to be found.” Yet postcards from the 1920’s to 1930’s clearly show it in it’s present location. Unfortunately it’s location is sort of hidden for visitors to really notice, unless they’re enjoying the park itself. But finding it is easy, from Burnside, head south on SW Vista Avenue (it’s NW 23rd on the North side of Burnside). Take the first right on SW Park Pl, then follow the road through the park. The statue is on the left before the stop sign.